The 23 Courageous boasts a proven Metal Shark hull design that has been engineered and built to deliver maximum economy, performance, and longevity. To achieve its superior hull life rating, the vessel’s hull, deck, and console are composed entirely of heavy, precision-welded plates of corrosion-resistant 5086 aluminum-magnesium alloy. 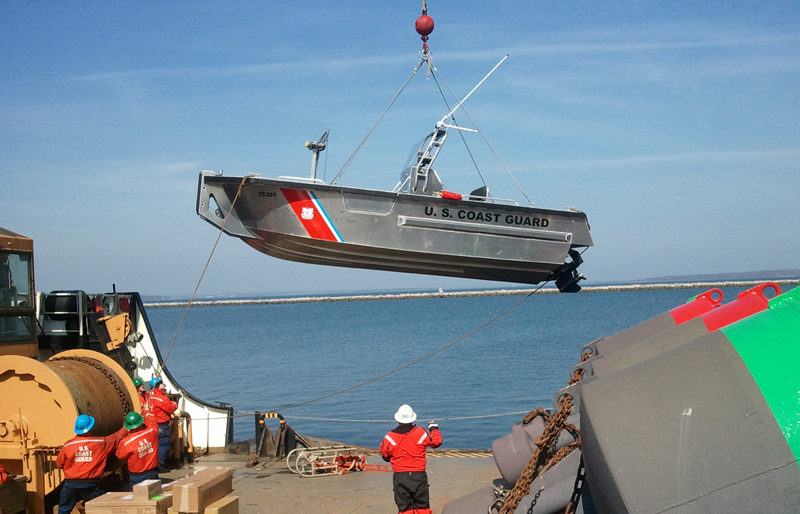 With its 8’ beam the 23 Courageous may be easily trailered, while on the water its impressive 20,000 lb. towing capacity gets the job done. While shown here with stern drive propulsion, the 23 Courageous is also available with single or twin outboard power up to 300 HP. Metal Shark is an OEM supplier for all major outboard brands and can rig according to customer preference or fleet commonality requirements. The 23 Courageous features a wide-open layout with flat floors from bow to stern that allow for easy 360-degree deck access. The vessel is easily handled by a lone operator, and offers outstanding visibility from the helm. Other mission-enhancing features include a self-bailing cockpit with oversized 6” scuppers, a large forward working platform, 20,000 lbs. towing capacity, and ample stowage space including a removable, lockable toolbox. 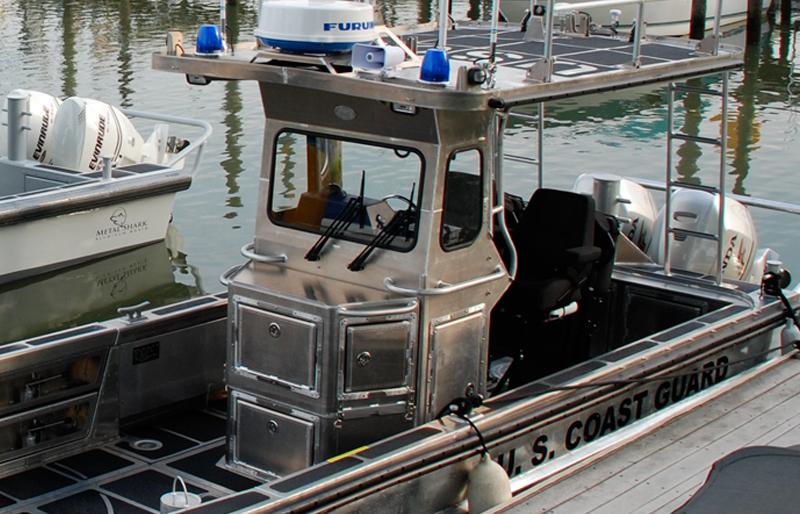 The 23 Courageous features a no-nonsense welded-aluminum center console with integrated windshield and large dash area. A straightforward helm layout places all instrumentation front and center, with vessel controls within easy reach. Like all Metal Shark vessels, the 23 Courageous may be fully customized to suit unique mission requirements. 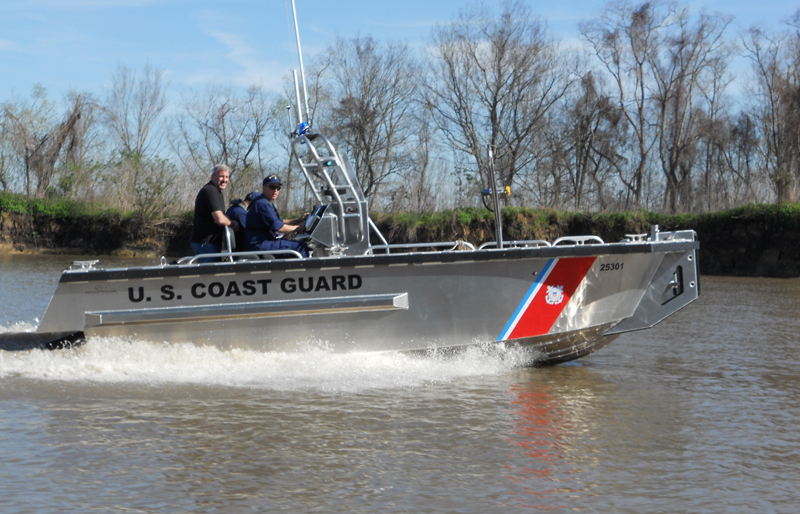 The left-hand photo shows a vessel as configured for the US Coast Guard, with a low-profile acrylic windscreen and compact radar arch allowing the vessel to be deployed via crane without interference from a bulky T-top. The right-hand photo shows a more traditional Courageous-class console with full-height windshield and oversized aluminum T-top with integrated overhead electronics pod. 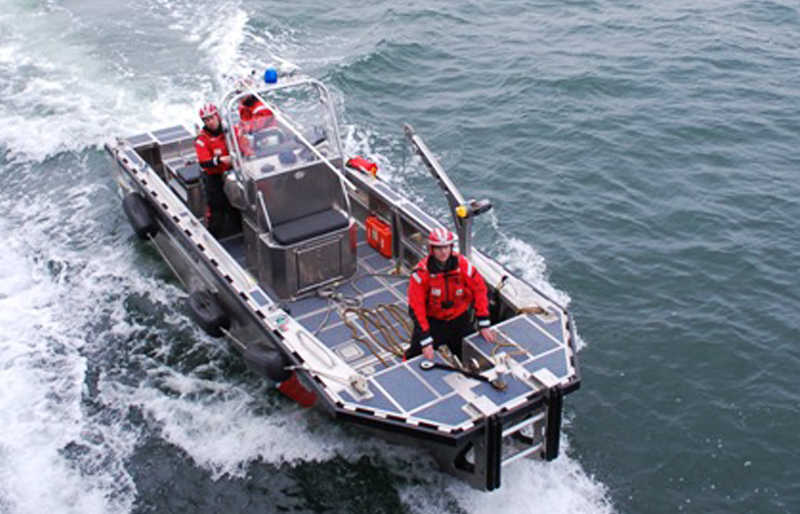 Paired with available shock-mitigating seating and full curtain enclosure package, the 23 Courageous serves as a safe, comfortable, and reliable all-weather platform ready for demanding on-water work.